When I walk around the vicinity of Crater I, I often see some sulfur lump in the rock holes like shown in this photograph. Mysterious! This rock is located approximately 650 meters from the sea level while the Crater I is 600 meters. So this sulfur had flown from Crater I to here by explosions. But in this case, I wonder how this sulfur lump entered in this rock hole. The sulfur is tightly fixed in it. Furthermore, this lump is composed of spherical particles and they seemed to welded each other. 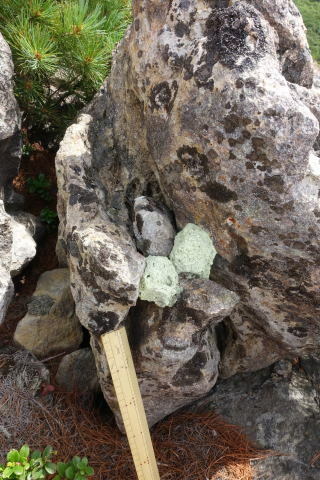 I implement that the molten sulfur in the Crater I was splashed into small particles and flew to this rock. Then the sulfur is still hot and soft and welded together. The ground seemed to be higher in that time to the level of this sulfur lump. To the top pageof this blog.